Notes: Softcover format. Collects the original monthly issues of #1-6. 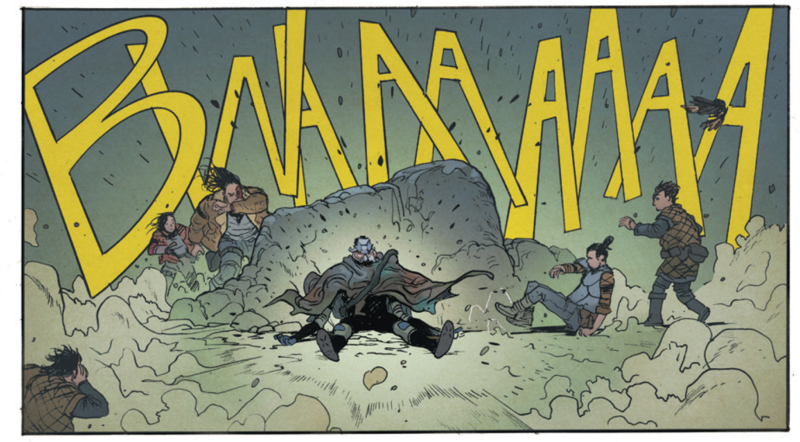 Extremity is an interesting series for those seeking something different in their post-apocalyptic style hybrid of fantasy and science fiction. 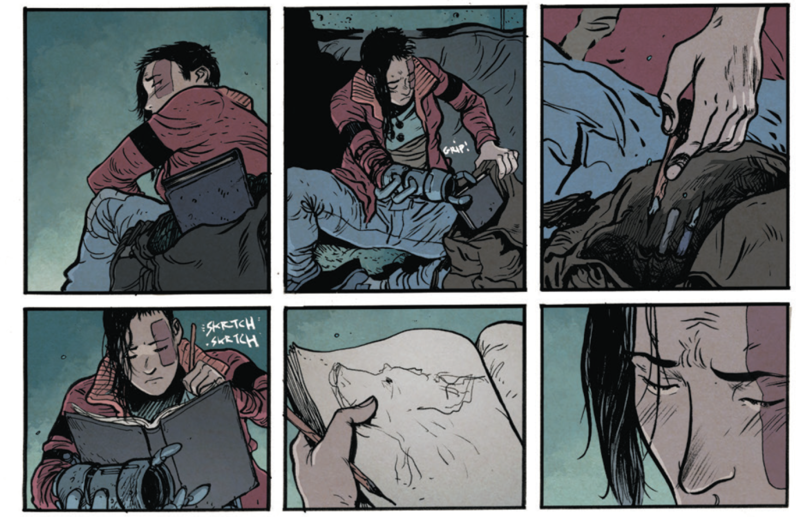 But more so, Extremity is an interesting journey of a family forever changed by oppression and violent conflict. This first volume focuses on the story of a father (Jerome) and his two offspring (Rollo and Thea), living in a strange world of floating lands, odd technology and beasts. Their livesa changed, after losing the mother’s life and home to a rival tribe. The family is affected greatly by this cruelty, and we see the changes and developments in character. The father takes his surviving children in a new direction, pushing them forward as soldiers, encouraging ruthlessness with no mercy for the enemy. The two children react differently, leading to some surprising twists and interesting character developments. The overall world-building is awesome, with some interesting ideas on technology, environment, and creatures. It’s a lot like Star Wars but set in a strange world. The character designs are a mix of cyberpunk, tribal and feudal era Japan, with some emphasis on badass styles borrowed from each. The action sequences bring out bigger panels, with some moments taking on an epic grandeur with much detail and clever angle of a cinematic approach to this epic family journey. The smaller character developments have excellent pacing with tearful moments, and changes that feel perfectly timed, not forced. The first volume feels like the first act of a long epic drama, where we get to know the players and setting. Each chapter takes a good time with its pacing while hitting the eyes with hard-hitting action sequences. There are moments with heavy and graphic violence, though presented to show brutality and seriousness of some very dark situations. the reactions of each, are the big payoff, towards what makes Extremity riveting. If you enjoy older school fantasy western animated classics like Naussica: Valley of the Wind, Heavy Metal, Trigun, or the Max Max: Fury Road movie, check out Extremity. 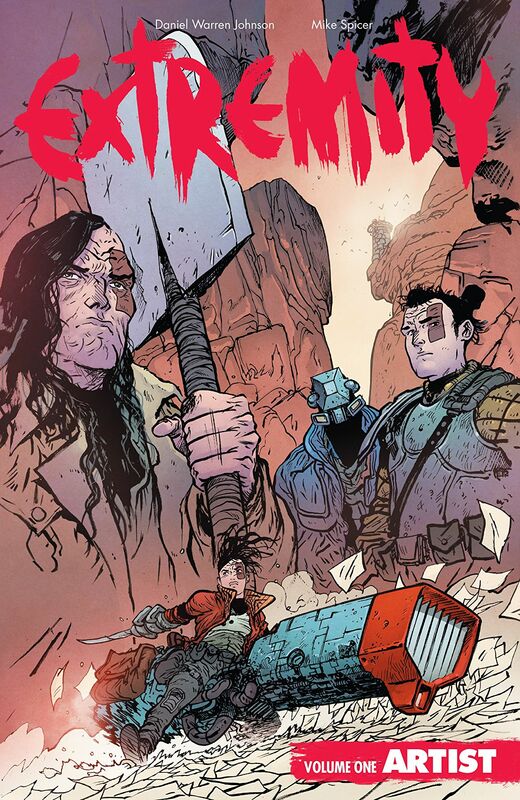 If you want something new and inventive that leads on character development, also check out Extremity: Volume 1. This read gives the right combination of storytelling, creative setting, and the excitement of a changing world where rules matter less. After finishing volume 1, you will likely find yourself wanting more.